Footage from the video capturing the killing of Agustin Gonsalez. Agustin Gonsalez had battled with mental illness for some time before Hayward police shot him 13 times during an incident last November. Police were summoned after Gonsalez, alleged to have a knife, got into an altercation with another man. 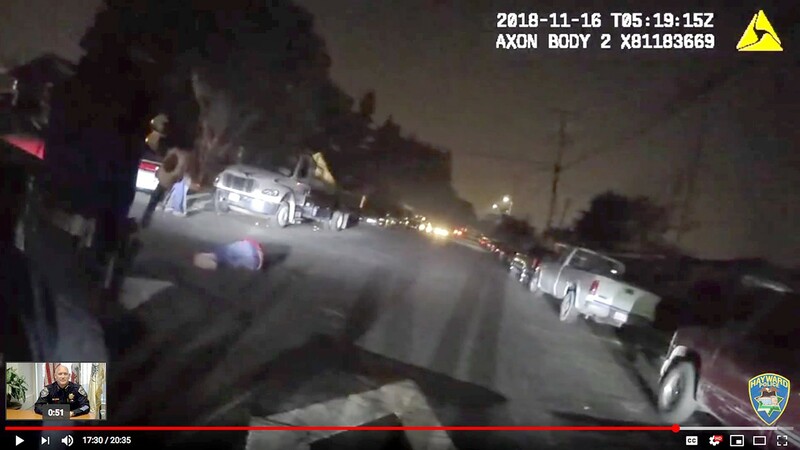 With Gonsalez's hands clasped at his knees, a Hayward police officer opened fire seven seconds after arriving on the scene. Gonsalez was later pronounced dead. The reported knife turned out to be a razor blade, according to police. "We knew he was battling with depression," said Lourdes Garcia, Gonsalez's aunt. "We knew he was cutting sometimes. When they said razor blade, we knew exactly what was going on." The family filed a wrongful death suit against the Hayward Police Department on Feb. 8. Several family members and advocates continue to question the police officer's decision to discharge his weapon so quickly and whether the department is properly trained in de-escalation tactics for the mental ill. But the family says Gonsalez was involved in a similar situation in Downtown Oakland just five months prior. In that case, two Oakland police officers aided Gonsalez during the episode and took him to the hospital for care, they said. "They found him in the street. He had the razor out and he was cutting himself," said Garcia. "Somebody called an officer to the scene. One sat next to him, the other stayed back, obviously to see if something might happen." The officer told Gonsalez, "I don't know what you're going through, but I'm going to help you get through this," the officer recounted to Garcia, before asking for the razor blade and taking Gonsalez to the hospital. "No fight. No nothing," Garcia added. Other members of Gonsalez' family briefly referenced the care Oakland Police apparently offered that night during a tense Hayward City Council meeting last Tuesday. Critical of Hayward Police's handling of the shooting and its aftermath, Garcia said the difference between the two departments is simple. "The difference is Hayward PD gave him seven seconds; the others talked to him," Garcia said. "They assessed the situation." Garcia says the family believes another incident similar to Oakland PD's interaction with Gonsalez also occurred in another East Bay city, but the details are not clear. Meanwhile, Gonsalez' family and friends are calling for an independent investigation of the incident. Hayward Police and the Alameda County District Attorney's Office are conducting ongoing investigations on the matter. But the family believes calls for a third-party investigation are necessary because of conflicts of interests between Alameda County District Attorney Nancy O'Malley, several Hayward councilmembers, and the contributions each have received in the past from various police labor unions. The outpouring of grief and criticism over the Gonsalez shooting was the third such demonstration at Hayward City Hall since December. Each time the city's reluctance to remark upon the incident due to the ongoing investigations left family members frustrated. But the mayor's apparent inability to show heartfelt compassion toward the family triggered a brief demonstration Tuesday night, momentarily pausing the public meeting. A similar situation occurred last month. Oakland teachers went on strike last week. At press time, teachers were holding out for a 12 percent pay raise, while the district was offering a 7 percent raise spread out over three years with a 1.5 percent increase paid retroactively. A state-appointed arbitrator's report concluded that the Oakland Unified School District cannot afford to oblige the union's demands, and state financial supervisor indicated that he would not approve the union's request. Into that potent brew, Oakland Council President Rebecca Kaplan revealed that she asked Gov. Gavin Newson to waive the remainder of the $100 million emergency loan given by the state in 2003 after the struggling Oakland Unified school District was placed in state receivership. Today, the loan balance is roughly $34 million. Kaplan sent a letter to Newsom asking him to forgive the loan during a period of time when the state is experiencing a large budget surplus. The extra funding could help the district and teachers bridge the gap in negotiations, Kaplan said. Last fall, Gov. Jerry Brown signed into law a bill that would allocate up to $52 million in relief for struggling school districts like Oakland. The law requires Oakland Unified submit a long-term and short-term financial outlook, in addition, to budget cuts over a four-year period. The deadline for Oakland Unified to submit its plan is Mar. 1. The three-page letter sent by former Alameda City Manager Jill Keimach that ignited a nine-month firestorm last year at City Hall contained a mysterious redacted passage. After the Alameda City Council approved a $21,735 settlement with now-former Alameda Firefighters Union President Jeff Del Bono last Tuesday, he said, in an interview, that the redacted portion of Keimach's letter referred to him and amounted to retaliation against his job at the fire department. "She was retaliating against me for doing my job," said Del Bono, who served as union president since 2011 before stepping down from the post last November. Del Bono is now deputy fire chief. Del Bono filed a complaint alleging Keimach and then-Councilmember Marilyn Ezzy Ashcraft made "false" allegations about him, and asked for $200,000 in damages. Keimach's letter accused Del Bono of violating various state and city laws and regulations and "involves the use by firefighter and union president Jeff DelBono of a city vehicle to drive to Mr. DelBono's personal cabin," she wrote. After an investigation, DelBono was cleared of any wrongdoing. He says the trip was authorized by then-Alameda Fire Chief Doug Long to monitor the August 2017 Railroad Fire in the Sierra National Forest, which included other Alameda firefighters. Although Del Bono's complaint, typically a precursor to a potential lawsuit, included a demand for $200,000, he never pursued the amount, he said. Last Tuesday's vote awarded Del Bono $21,735, the same amount as the union's legal costs for representing him in the case. "I just want to be cleared and make the union whole," he added. Back in 2015, San Leandro was one of the first local cities, outside of Oakland and Berkeley, to embrace the future of medical cannabis dispensaries. But that early decision is costing the city dearly after California voters approved legislation of all cannabis more than a year later. Now San Leandro city officials are moving toward offering licensed operators the ability to sell retail adult use cannabis. A city staff presentation last week also recommended the council look at imposing a "shot clock" on the two permitted medical cannabis operators that have yet to open despite being granted approvals by the City Council in 2015 and 2016. Currently, San Leandro is surrounded by a sea of East Bay cities that already allow retail adult use cannabis, including Oakland, Berkeley, Emeryville, Alameda, Hayward, and unincorporated Alameda County. "It is currently unclear whether medical-only cannabis dispensaries will remain financially viable in San Leandro over the long-term given the close proximity of alternative access to the adult-use market," according to a staff report released last week. "Representatives from San Leandro's three permitted dispensaries expressed to staff that their businesses would remain at a competitive disadvantage if the City does not allow them to serve the adult use market." Harborside, Blum, and the Davis Street Wellness Center represent San Leandro's permitted dispensary operators, but only Blum, which opened its doors last month, is currently in business. The lack of tax revenue from medical cannabis sales has been a concern to the city in recent months. Are Hayward Landlords Exploting Housing Crisis? A recent Hayward city staff report said landlords there may be using the housing crisis as a pretext for sharply raising rents. Although the city has long had rent stabilization legislation on the books, the number of units covered by the ordinance has dwindled over the years to an estimated 1,600 in a city of 140,000 residents. The council in May 2018 passed a moratorium on vacancy-decontrol while the issue is studied. But a staff report last week made a stark conclusion about the general attitude of landlords during this current housing crisis, "While there are many landlords that provide quality housing regardless of demand, there are examples indicating that there is a significant amount of housing instability in Hayward and that some landlords may be taking advantage of the housing crisis." Nearly half of all Hayward tenants spend 35 percent or more of their monthly income on rent.